I've been working out on a more regular schedule (and more intensively) for a few months now. I started with doubts, thinking I would get unmotivated and discouraged within a few weeks, and would quit before seeing any results. Well, I didn't. And I actually truly enjoy it- I feel more energized, more satisfied, and happier. I would never EVER have thought that a daily routine of at-home workouts would contribute to my happiness in a positive way, but I was wrong! I found a routine that works for me by trial and error, and I'm still constantly tweaking it, but online resources were my starting point and I thought some of them (all free) were worth sharing if you're just starting, want to start, or are currently building a workout routine. 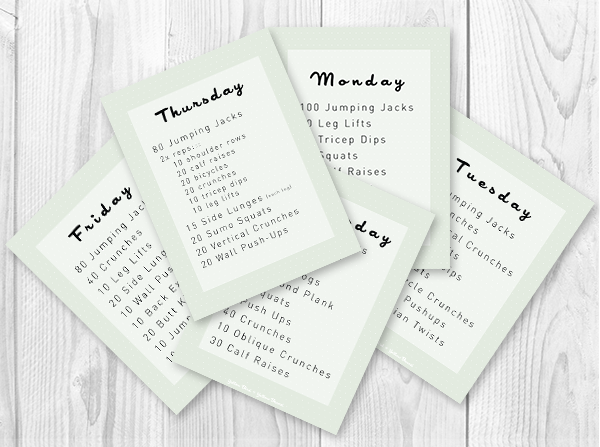 Workout Labs allows you to create printable workout plans with exercise illustrations, free. You can either start from scratch or customize one of their plans. You can browse a list of all illustrated exercises or filter them by muscle group and/or equipment, which makes it easy to discover new exercises to try (and learn how to perform them properly). Simply drag and drop the exercises you like into the workout builder, rearrange them and specify sets and repetitions or time in seconds. When you're done, just download and print! I built my workout routine with Workout Labs. If you don't know where to start, you can either browse their plans or use my workout routine as a starter. Feel free to change the name of the workout, remove some exercises, add some, rearrange them or change the number of reps to make it work for you! I have a slightly different routine for each day of the week, except Mondays. I go to the swimming pool on Mondays so I take this day off from working out. The only equipments I use are dumbbells and an exercise mat. I usually start by running on the spot for 5 minutes, follow with my routine, and end with basic stretches (30 secs for each pose). Every other day, I add a short arm toning workout (because my arms are my weakest point). 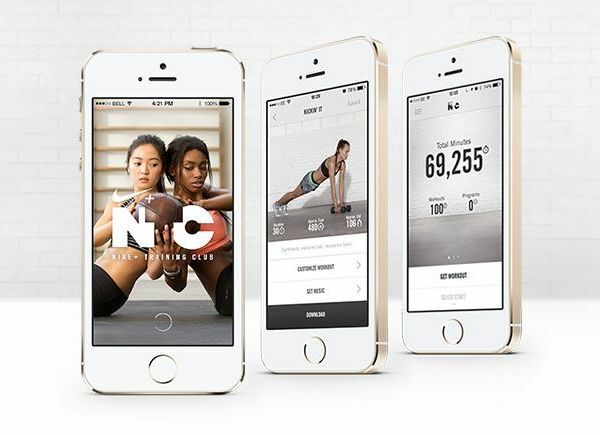 The Nike Training Club app is my absolute favorite fitness app (and I've tried numerous ones). There are 100+ workouts, broken down into four categories (get lean, get toned, get strong, get focused) and three levels (beginner to advanced). Most of them are either 30 minutes or 45 minutes programs. Each workout includes a timer, video demonstrations of the exercises, words of encouragement, tips, and more! If I had to be critical, I'd say that there are not many customization options, and that even the beginner level may be hard if you're just starting and not used to exercising or being active. If you find it too intense, don't burn yourself out! Start small, and come back to the app later. My sweet and inspiring e-friend Janee from Yellow Bird, Yellow Beard shared her workout routine as part of her series on her weight loss journey. She first posted it here, then updated it here. I really like it because it's easy to follow and doesn't require any special equipment. I easily get bored when working out, so I printed out Janee's routine and I'm doing it for two weeks to change from my usual routine (that I shared in the first item of this post). This 5 week workout plan consists of a calendar that tells you exactly what to do each day (Monday through Friday) and five pages of exercises. That's what I first started with. I really enjoyed the calendar- checking the box when you have completed the workout is so satisfying! However, I got frustrated by the lack of variety, and I quickly found the exercises a bit too easy. If you're not used to exercising, or don't have much time per day, it can be a great starting point. It's originally from Seventeen magazine and can be found on Pinterest (via Kris). The vast majority of the music I typically listen to isn't well suited for fitness or running, and I was really at loss when I tried to create a playlist to accompany my workouts. I started with Spotify's premade playlists. 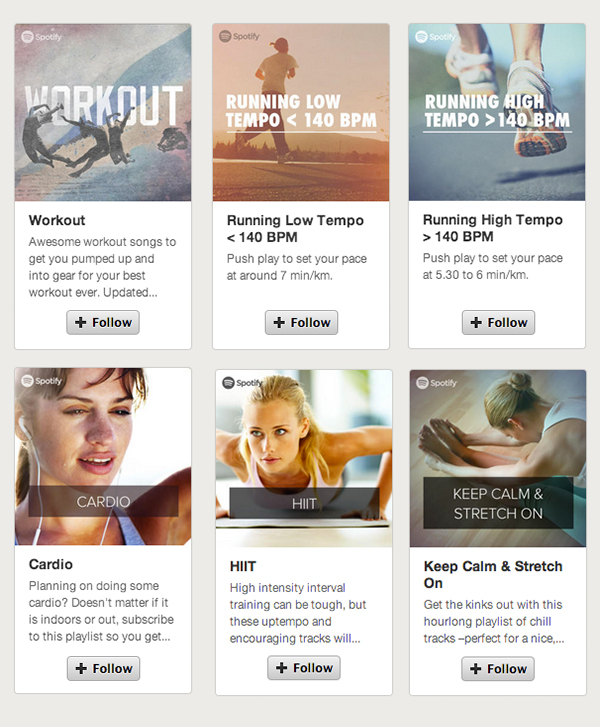 On Spotify, click on browse, then select workout- you'll find a never-ending choice of playlists! I have now built a workout/running playlist of my own that I am actually quite embarrassed to share here! Whenever I share it with someone, I get that semi-condescendent, semi-impressed, fully surprised look (Are you familiar with that look you get when you say or do something weird? I definitely am)- followed by a "What? You work out to that playlist?" Well, yes I do. And it works for me. So maybe you'll find a song or two that might work for you too? Some are more fast-paced and upbeat than others, so I usually rearrange them before my workout to make sure they'll fit. And I currently always end my stretches with the last song from this playlist (Girls by Eleni Mandell), my latest musical obsession. If you have music to recommend, I'd love to hear your suggestions. I'm still building my playlist and it's kind of a hard task for me. Oh, and if you know of any great workout resources, I'd be happy to add them to the list! Those are great resources! Another song I love to work out to is "Hey Brother" by Avicii. Girl, you just rocked my morning. I've got your playlist playing at work, and it's awesome! I'm so, SO happy to hear that! Oh it's actually one of my favorite songs! Can't believe I forgot it. Added it, thank you so much! wow, I've been using spotify for years and I can't believe I didn't know about their workout playlists. thanks for the tip! I love this playlist!! thanks for sharing! !